We’ve all been there… we interview for a job we’re excited about it, feel it went pretty well, and then play the waiting game. Days pass, then weeks, and we wonder, when should we follow up with the company and how? This post is all about how to write a follow up email after an interview and includes a template you can use. There are generally at least two follow up touch points in any job interview process. The first form of following up is actually sending a thank you note to your interviewer. This should be done immediately after your interview (related post on sending thank you notes here). 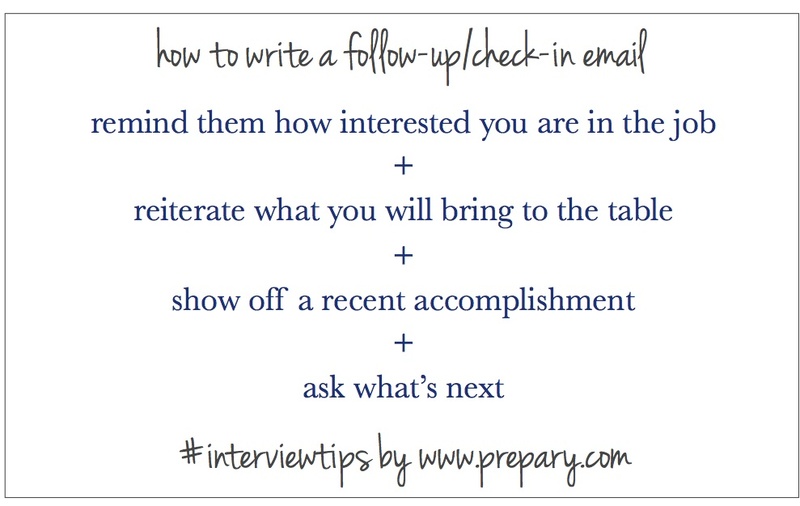 I recommend sending the thank you note (follow up #1) the day of the interview or the day after. Then you wait a bit to hear what’s next. The frustrating thing is that in many cases, time will pass and you’ll still be left wondering where you stand. In terms of timing, I usually recommend waiting to send this type of follow up email 1-1.5 weeks after an interview if you haven’t heard anything. I have another post here about the 3-2-1 rule of following up after interviews that you should also check out. But when you write the email, what do you say? After about a week and a half has gone by you’ll have had even more time to reflect on the opportunity and your interview. When you follow up, be sure to communicate that you’ve been thinking about it and remain really excited and enthusiastic. In the interview you hopefully explained why you would be an asset to the company and a perfect fit for the job. No harm in reminding your interviewer the types of skills you bring to the table and how you can make an immediate impact. It won’t be new information, but it’s worth emphasizing. This won’t always be possible, but in certain fields and situations, you may have a recent accomplishment to show off. For example, if you work in PR and have just got your company some amazing press you could share it. If you have organized an event that went off without a hitch, you can mention that. The most important part of the “follow up” email is to find out what’s next. While you reaching out won’t be able to speed up the process, the goal is to get information so you are in the loop. Great recruiters will be transparent with you about what types of things are unfolding in the process and what the timeline looks like. They will also let you know if they need additional information from you. Thank you again for the time you spent with me last [enter day you spoke]. Since our interview, I’ve been thinking a lot about the [insert job name] job and I remain incredibly excited about it. I know that my past experience with [x, y, and z] will make me an incredible asset to [company name]. I wanted to check in on next steps in the interview process. Please let me know if I can provide any additional information and if you have any information on what’s next. As always, the template is just a starting point. The more unique and personal your outreach is, the better. One of the most discouraging parts about following up is just waiting for a response and wondering where you stand. For some additional tips on how to make sure you are following up “appropriately” check out this post with some tips. Most of all, hang in there… and I hope you’ll have some answers soon!